Announcing a new toolkit for Migrant and Seasonal Head Start programs to serve and use more local foods! 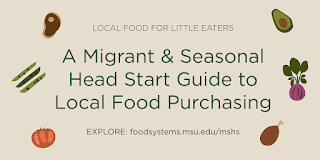 The MSU Center for Regional Food Systems is pleased to announce Local Food for Little Eaters: A Migrant & Seasonal Head Start Guide to Local Food Purchasing, as well as profiles of successful farm to Migrant & Seasonal Head Start (MSHS) programs nationwide. 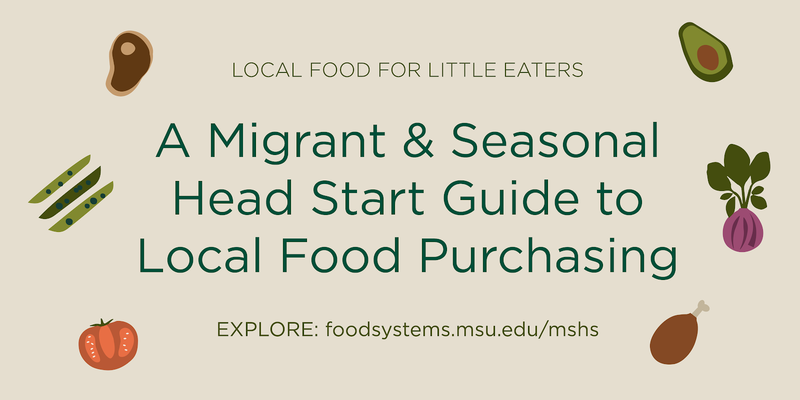 The companion piece, Farm to Migrant and Seasonal Head Start in Action, offers case studies highlighting Migrant & Seasonal Head Start programs nationwide that, through local foods, are reflecting and celebrating the cultures of children and families they engage. Explore and share these tools with your networks! For more information, contact Meagan Shedd mshedd@msu.edu. Please help spread the word! Suggested social media posts are below. Click here for images you can include in your posts.